What are they? What do they do? What's the big deal about about them anyway? <?xml:namespace prefix = o ns = "urn:schemas-microsoft-com:office:office" />Timing belts keep the valves from colliding with the pistons. They synchronize the opening and closing of the intake and exhaust valves with the upward & downward motion of the pistons to work in perfect harmony so that the engine can run and produce power which is the foundation for all other systems to function correctly. Systems such as; fuel, electrical as well as the on board diagnostic system. 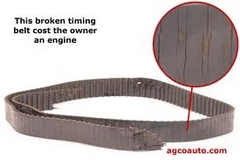 Timing belts are typically made of rubber with nylon synthetic reinforced cords and as time and mileage increase the timing belt will fatigue in various forms such as stretching cracking & fraying. Manufacturers achieve this by producing small high output high compression engines with multivalve valves, camshafts variable valve timing all working in harmony because of the timing belt synchronizing them all together. Manufacturers also have their recommended replacement interval usually based on time or mileage whichever comes first. These recommendations are only meant to be used as a guide only! Everyone drives differently. Where you drive? How you drive? 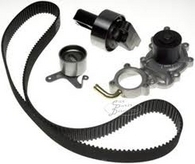 What you drive all are determining factors when replacing a timing belt. For example the harsh hot weather in the Southwest destroys anything that’s rubber the dry heat dries out and crystalizes rubber making brittle weak and vulnerable to failure. This type of driving condition is very severe and very hard on vehicles whereas the cool damp climate of the Northeast is very mild on rubber components. Replacing the timing belt should be done between 5-6 years or between 60-90 miles whichever comes first. One important thing to understand when having the timing belt replaced is it's rarely just replacement of the timing belt only! That’s because there are other parts associated with timing belts function that must be inspected to ensure lone trouble free operation. 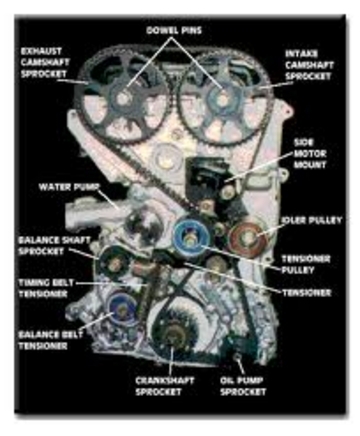 For example; most water pumps are driven by the timing belt these are prone to leakage and bearing failure as mileage increases replacing it while the timing belt is removed is very common practice.